SALLY BAYLEY put herself into care aged fourteen and remains the only person to study at university from the West Sussex Care Service. 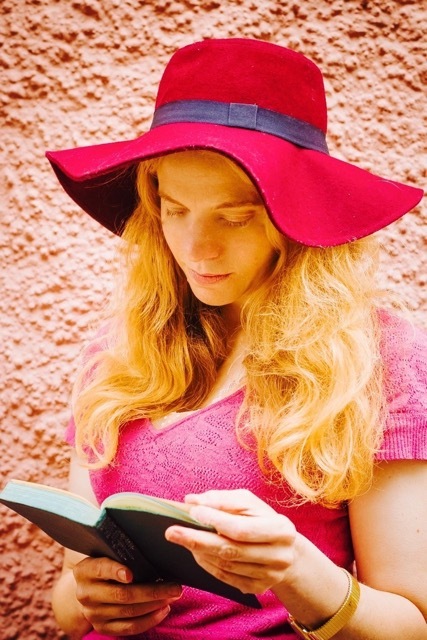 She is currently a Teaching and Research Fellow at the Rothermere American Institute at the University of Oxford, and from September 2018 she will be teaching writing in Oxford as a Royal Literary Fund Fellow. She is the author of The Private Life of the Diary, as well as books on Sylvia Plath and Emily Dickinson. 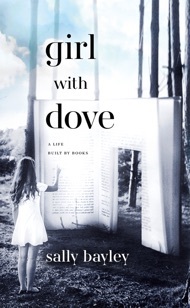 GIRL WITH DOVE is Sally Bayley’s strikingly original memoir describing how she escaped her disturbed upbringing by disappearing into a world of books is an extraordinary testament to the transformative power of reading and the literary imagination. Growing up in a dilapidated house in Sussex run as a cult by her aunt, Sally’s childhood world was filled with mystery and intrigue. Men were forbidden and hippies trailed through the kitchen looking for God. When Sally’s baby brother vanishes from his pram she becomes suspicious of the activities going on around her. What happened to Baby David and the woman called Poor Sue? And where did all the people singing and wailing prayers in the front room suddenly go? Disappearing into a world of books and reading, Sally adopts the tried and tested methods of Miss Marple. Taking books for hints and clues, she turns herself into a reading detective. Her discovery of Jane Eyre marks the beginning of a journey through Victorian literature where she also finds the kind, eccentric figure of Chares Dickens’ Betsey Trotwood. These characters soon become her heroines, acting as a part of an alternative family, offering humour and guidance during many difficult moments in Sally’s life. Weaving literary classics with a young girl’s coming of age story, GIRL WITH DOVE is the account of a child’s adventures in wonderland and her search for truth in an adult world, often cast in deep shadow, which vividly demonstrates the power of great literature and of imagination to build a life, no matter how unhappy the circumstances. I’ve always had an idea in my head of how my PhD novel should be though to date it is not that at all. GIRL WITH DOVE is. It is the sort of literary novel I aspire to with it’s expert intertexuality and novel characterisation. I’m particularly delighted to welcome author Sally Bayley to the blog to answer some questions about the depiction of care experience in GIRL WITH DOVE. Writing is a compulsive habit but a positive compulsion. I’ve been writing since I was seven or eight. Most of my writing is rooted in poetry. Poetry is my first craft. I loved the poetry competition at my junior school and I took this very seriously; too seriously considering I was surrounded by boys ‘fixing the cricket scores’ so to speak. GIRL WITH DOVE emerges from the sound of my mother’s voice reciting her favourite lines of poetry and then her singing voice. The structure of the book follows her habits as a seamstress; her laying-out of dress patterns and her marking up of hems. What made you choose to write about care experience? I didn’t choose it; it is simply part of my coming of age. I signed myself into Care aged 14. It was a matter of necessity. Foster homes, and later on the children’s unit where I spent two years, were necessary transitions or odd portals (refugee camps) away from a very controlling environment. I grew up in a family dominated by a cultic personality – my Aunt Di. Her forceful personality broke up the original bonds of my first family. Foster care was an emergency response to her coercive control and my rather severe (Jane Eyre inspired) response to that control: to stop eating. By the time I left home I was imaginatively coated in Victorian literature to the extent that I had re-imagined myself as a Jane Eyre orphan-rebel. GIRL WITH DOVE is a direct reference to the blue period painting by Pablo Picasso which depicts a young girl (who also resembles a boy) clutching a dove. This painting hung inside the dining hall of the children’s unit where I remained aged 14-16. It was splattered with sauce and ketchup and carried the marks of daily abuse and altercations. The painting was itself a sort of orphan: ignored, abandoned and poorly treated. Years later I encountered the original painting in the Louvre; I turned the corner and there it was. I sat down and wept and remembered Zion, as Boney M sang, (a song I heard throughout my childhood). I’m writing a second part to GIRL WITH DOVE which will tell a coming of age story from a boy’s point of view. I grew up with brothers in a household depleted of men. Men were practically banished by my aunt who functioned as a female patriarch. This next book will pursue a male coming of age story told by a girl who sympathises with male experience and endeavours – imaginatively speaking – to become one of them. My literary role model is Shakespeare which I began to read avidly from the age of 13. I begin my story with the characters and mis-en-scene of A Midsummer Night’s Dream and then The Merchant of Venice. As the book comes into focus I turn to the characters of Henry IV part 1 and 2: Prince Hal, Poins and Falstaff, a version of The Three Musketeers, but also of my three brothers. The first part of the book is entitled GIRL STILL; the second part is called TURNING BOY and for this part I adopt the character of Jessica from The Merchant of Venice because she allows me to turn from girl to boy. In Shakespearean terms this is a matter of theatrical disguise; in my story it is also a basic survival method. Jessica escapes from her father’s house dressed as a boy. I escaped from my aunt’s house more resembling a boy than a girl. My female body life was on hold. I stowed that body away until later. The latter part of the book will focus on the male characters in my family. I tell the scrappy and incomplete version of my father’s history, which began in the Gorbals of Glasgow, where drink and violence and spatial deprivation – 14 to a room – were part of daily life. NO BOYS PLAY HERE (working title) explores the relationship between the elect and the unelected in English social history. The character of Falstaff in Shakespeare’s HENRY IV is an archetype for the unwanted child and unwanted parent and the individual citizen who lives off the state. In the case of my biological family this translated into living from the benefits system. What diverse characters in literature do you most admire? Characters which embody both male and female aspects. Shakespeare is able to represent the theatrical relationship between boy and girl roles because of the contemporary conventions of his theatrical world where men are culturally obliged to play the parts of women. At the same time, his plays are structured around poetic conventions, particularly love poetry, the sonnet, and the tradition of the Lover’s Complaint. As a child I was always drawn to characters who stand beyond the confines of gender and history: Aslan in The Lion, The Witch and The Wardrobe, or the character of Merlin in Susan Cooper’s The Dark is Rising series. The most compelling stories, I found, were based on myth. Myth is a way of exploring cultural archetypes and in my household (influenced by my aunt’s hobbyistic interest in the unconscious and Carl Jung) there was much talk of ‘the unconscious mind.’ As a child I was often asked to report on the symbolic content of my dreams on the way to the loo in the morning. Mary Poppins, because she appears out of nowhere, never has to explain herself, and gets things done. Time – the length of her sojourn – is always on her terms. She’s involved in family life but only as a rarefied visitor. She always has a swift and elegant exit strategy: her sturdy umbrella. This entry was posted in Blog and tagged David Copperfield, Foster care, Jane Eyre, Miss Marple, Pablo Picasso, Poetry, residential care, Shakespeare, system. Bookmark the permalink.